Briefing: Agent Gianluigi Buffon (aka “The Great Wall of Italy”) has been a MNT member since 1997 and he played a huge role in its successful Mission 2006. He has taken part in over 400 professional missions with Parma and Juventus as well and captured several trophies for his sides. He may be the most important member of the MNT. 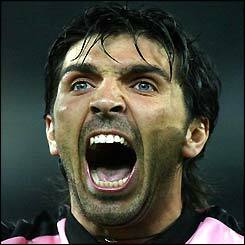 Special Skills: Agent Buffon was destined from birth to be a great goalkeeper for the MNT. His father was a weightlifter, his mother threw discus, both of his sisters were volleyball stars, and his uncle was a MNT keeper as well. His imposing size (6’3″) and his intelligent style have made him the world’s best living goalie and a FIFA 100 member. International Actions: Agent Buffon was first selected for a MNT mission when he was only nineteen years old and in the last 12 years he has taken part in over 90 missions with the squad. He was on the Mission 1998 and 2002 teams as a backup, but in Germany he was the starter and he never conceded a single goal during the regular run of play. Mission: Agent Buffon’s mission, should he decide to accept it, is to match his Mission 2006 performance in South Africa in 2010. While such a feat may actually be impossible, the ITA MNT has never been renowned for its attack, so he must continue to keep their sheets as clean as possible. This message will self-destruct in five seconds.